Dr. Bhagat, a partner and an extremely valuable member of The Sterling Dental Clinic has been part of the team since the establishment of the clinic in the year 2001. 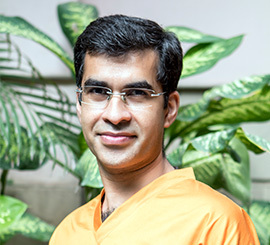 He is an alumnus of KLE’s Dental College, Belgaum, and a Masters in Orthodontics and Dentofacial Orthopaedics. He is an integral part of the Sterling family, and also the consultant in-charge at the department of dental surgery at Sant Parmanand Hospital, New Delhi and a Professor at IDST dental college and hospital Modinagar, UP. HHe was also a team sponsor and a coach at the Delhi International Football League (DIFL) and forms an amazing connection with children.